U.S. President Barack Obama said in an interview with Jeffrey Goldberg that Israeli Prime Minister Benjamin Netanyahu's anti-Arab remarks on Election Day has "foreign-policy consequences," The Atlantic reported on Thursday. The U.S. president made it clear during the interview with the American periodical on Tuesday that Netanyahu's portrayal of Arab voters as "an invading force that might vote" is contrary to the very language of the Israeli Declaration of Independence, which explicitly states that all people regardless of race or religion are full participants in the democracy." "When something like that happens, that has foreign policy consequences, and precisely because we’re so close to Israel, for us to simply stand there and say nothing would have meant that this office, the Oval Office, lost credibility when it came to speaking out on these issues,” he said. 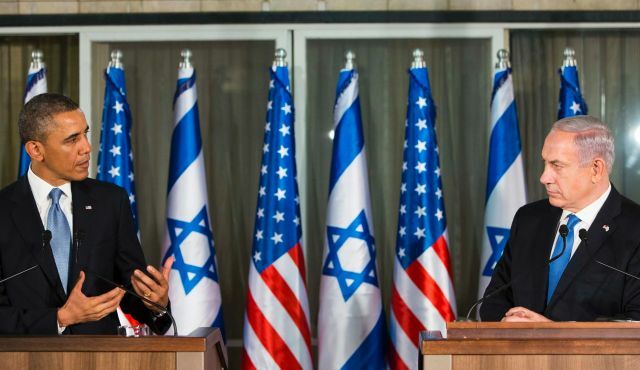 Obama remarked in the interview that despite the confrontations with Netanyahu over the past number of years, most of the American Jewish community still voted for him in the 2012 presidential election. "What I also think is that there has been a very concerted effort on the part of some political forces to equate being pro-Israel, and hence being supportive of the Jewish people, with a rubber stamp on a particular set of policies coming out of the Israeli government," he said. "So if you are questioning settlement policy, that indicates you’re anti-Israeli, or that indicates you’re anti-Jewish. If you express compassion or empathy towards Palestinian youth, who are dealing with checkpoints or restrictions on their ability to travel, then you are suspect in terms of your support of Israel. If you are willing to get into public disagreements with the Israeli government, then the notion is that you are being anti-Israel, and by extension, anti-Jewish. I completely reject that." During the Atlantic interview, Obama expressed deep concern with the direction Israel has been heading, especially in everything regarding its democratic values. Obama remarked that "precisely because" he cares so much about Israel and the Jewish people, "I feel obliged to speak honestly and truthfully about what I think will be most likely to lead to long-term security, and will best position us to continue to combat anti-Semitism, and I make no apologies for that precisely because I am secure and confident about how deeply I care about Israel and the Jewish people." Obama stressed that he sees as a moral obligation the defense of Israel and standing up for its right to exist, especially because of the lessons of the 20th century. "And so, to me, being pro-Israel and pro-Jewish is part and parcel with the values that I've been fighting for since I was politically conscious and started getting involved in politics," Obama said to the Atlantic. "There’s a direct line between supporting the right of the Jewish people to have a homeland and to feel safe and free of discrimination and persecution, and the right of African Americans to vote and have equal protection under the law. These things are indivisible in my mind." On the other hand, he said that it is also true that by extension he has "to show that same kind of regard to other peoples. And I think it is true to Israel’s traditions and its values—its founding principles—that it has to care about those Palestinian kids." He recalled that when he spoke in Jerusalem, "the biggest applause that I got was when I spoke about those kids I had visited in Ramallah, and I said to an Israeli audience that it is profoundly Jewish, it is profoundly consistent with Israel’s traditions to care about them. And they agreed." "So if that’s not translated into policy—if we’re not willing to take risks on behalf of those values—then those principles become empty words, and in fact, in my mind, it makes it more difficult for us to continue to promote those values when it comes to protecting Israel internationally," he told the Atlantic. The American president added that when he defends Israel on the international stage, especially against anti-Semitism and anti-Israel policies that are based on hostility rather than "the particulars of the Palestinian cause" he needs credibility. Therefore, he is required to "honest with friends about how I view these issues," he remarked. "Now that makes, understandably, folks both in Israel and here in the United States uncomfortable," he noted. "But the one argument that I very much have been concerned about, and it has gotten stronger over the last 10 years ... it’s less overt than the arguments that a Sheldon Adelson makes, but in some ways can be just as pernicious, is this argument that there should not be disagreements in public," the president added. Obama noted that he is criticized for criticizing Israel, even though farm more contentious arguments are made in the cafes of Tel Aviv or Jerusalem. He stressed, though, that the most important thing the U.S. can do to strengthen Israel's position is to tell the prime minister that achieving peace requires some risks. "And the question you have to ask yourself then is: How do you weigh those risks against the risks of doing nothing and just perpetuating the status quo?" Obama said. "My argument is that the risks of doing nothing are far greater," he said. Ultimately, it is important for the Israeli people and the Israeli government to make its own decisions about what it needs to secure the people of that nation," he conceded. “My hope is that over time [the] debate gets back on a path where there’s some semblance of hope and not simply fear, because it feels to me as if, if all we are talking about is based from fear,” Obama said. “Over the short term that may seem wise—cynicism always seems a little wise—but it may lead Israel down a path in which it’s very hard to protect itself [as] a Jewish-majority democracy." Obama told the Atlantic that he grew up on the Israel of kibbutzim, Moshe Dayan and Golda Meir, "and the sense that not only are we creating a safe Jewish homeland, but also we are remaking the world." He recalled that these values shaped him as a politician. He said he told a group of Jewish leaders he has high expectations for Israel, which he considers neither unrealistic nor stupid. "I want Israel, in the same way that I want the United States, to embody the Judeo-Christian and, ultimately then, what I believe are human or universal values that have led to progress over a millennium," he stressed. "The same values that led to the end of Jim Crow and slavery. The same values that led to Nelson Mandela being freed and a multiracial democracy emerging in South Africa….the same values that lead us to speak out against anti-Semitism. I want Israel to embody these values because Israel is aligned with us in that fight for what I believe to be true. And that doesn’t mean there aren’t tough choices and there aren’t compromises. It doesn’t mean that we don’t have to ask ourselves very tough questions about, in the short term, do we have to protect ourselves." Obama remarked that despite his criticism of Netanyahu and his government's policy, he has constantly worked since entering the White House to ramp up military, security and intelligence aide to Israel. He said even his biggest critics in Israel admit as much. He noted that during the last American push for an Israeli-Palestinian peace deal, he sent top American army officials to Israel to determine its security needs for a two-state era. "So this isn’t an issue of being naive or unrealistic, but ultimately yes, I think there are certain values that the United States, at its best, exemplifies. I think there are certain values that Israel, and the Jewish tradition, at its best exemplifies," he said. "And I am willing to fight for those values." According to Obama, he needs to be able to tell Israel he doesn't agree with a particular policy like the settlements, checkpoints and the Jewish nationality law. He said this is "entirely consistent with being supportive of the State of Israel and the Jewish people." He added: "Now for someone in Israel, including the prime minister, to disagree with those policy positions—that’s OK too. And we can have a debate, and we can have an argument. But you can’t equate people of good will who are concerned about those issues with somebody who is hostile towards Israel." Members of the newly sworn in 34th government posed for the traditional group photo at the presidential compound in Jerusalem on Tuesday. 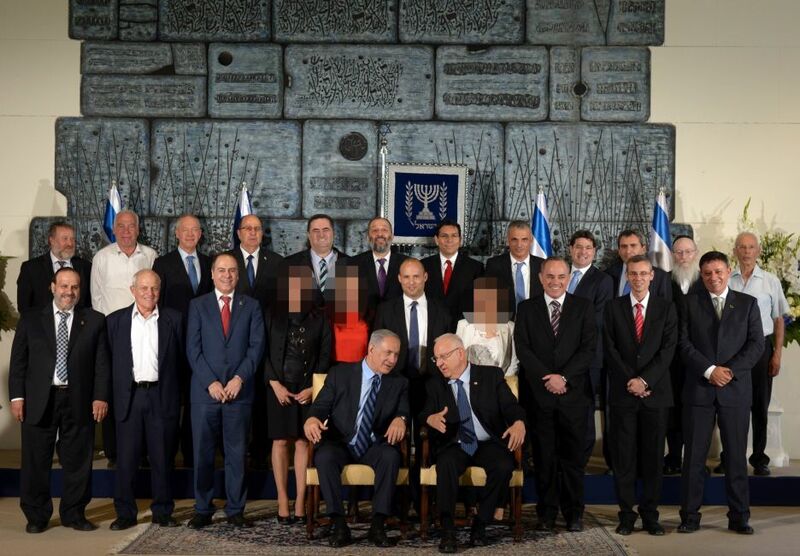 In the center are three women -- Miri Regev (sports and culture), Ayelet Shaked (justice), and Gila Gamliel (minister for senior citizens) -- surrounded by 21 men. Ultra-Orthodox website Behadrey Haredim, which calls itself the "world's largest Haredim (ultra-Orthodox) portal," published the picture but blurred the women's faces. "It's sad that technologically Behadrey Haredim has reached the 21st century, but as far as excluding women (from the public domain), it's still in the Middle Ages," said Rabbi Uri Regev, whose Hiddush movement advocates "religious liberty and the liberal movements of Judaism. "The ultra-Orthodox print press sidestepped the issue on Wednesday by not publishing the picture. But on Thursday the weekly Yom Leyom newspaper, closely identified with the ultra-Orthodox Shas that is part of the new coalition, published it, completely deleting the women -- apart from Gamliel's feet which survived the cut. "Shas's newspaper presents -- the transparent ones," head of the leftwing opposition Meretz party Zehava Galon wrote on Facebook, alluding to Shas declaring during campaigning it would be a voice for the oppressed and "transparent" strata of Israeli society. Behadrey Haredim editor Avi Grintsaig said the practice of deleting women from pictures did not derive from Jewish law, "and certainly doesn't reflect our opinion on the women at hand." Ultra-Orthodox publications tend to avoid publishing pictures that include women on what they call grounds of modesty, but at times resort to creative solutions when the picture's general value is high. Behadrey Haredim's competition, Kikar Hashabat, hid US reality TV star Kim Kardashian in a handout photo of her meeting with Jerusalem's mayor last month. And in January, Haredi newspaper Hamevaser "vanished" German Chancellor Angela Merkel from a picture of world leaders marching in Paris against terrorism. A senior Israeli government official warned as early as in 1968 that punitive demolitions and deportations of Palestinians in the occupied Palestinian territory (OPT) constitute violations of international humanitarian law. 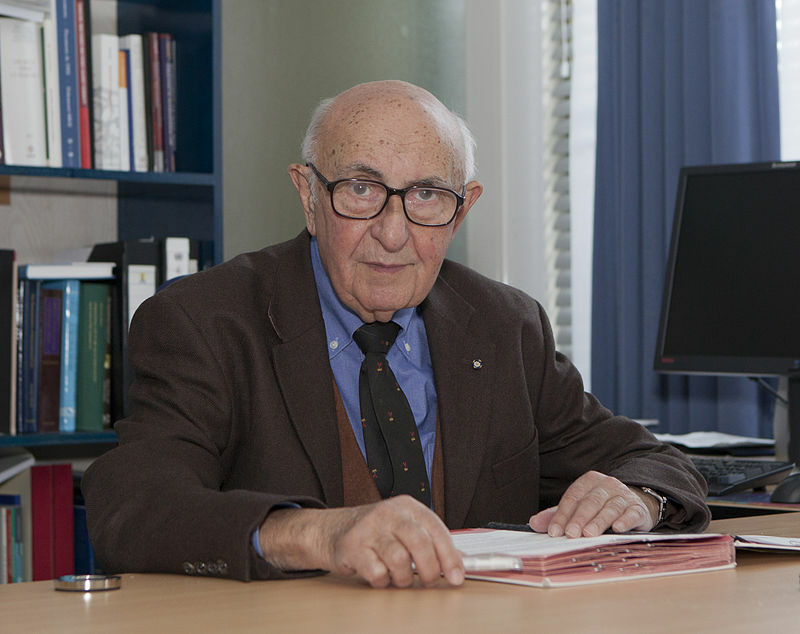 Theodor Meron, then Israeli Foreign Ministry legal adviser, sent his opinion to the Israeli prime minister's office in a memo marked "Top Secret". The memo was discovered and made public last week by an organisation investigating the archives for relevant material on human rights. According to the memo, Meron – like almost all contemporary jurists and legal scholars – said the punitive home demolitions and deportations violated the 1949 Fourth Geneva Convention on the protection of civilians in war. Any other argument was just unsubstantiated hasbara. According to author Gershom Gorenberg, writing in Haaretz: "The discovery of Meron's memo on demolitions and deportations is additional evidence that the regime under which the West Bank is governed began in deception and has been maintained by self-deception – by the government, by the hasbara machine and sometimes by our Supreme Court." In 2006, another memo of Meron's was revealed, in which, just three months after Israel's rule over the OPT began in 1967, he stated that "civilian settlement in the administered territories contravenes explicit provisions of the Fourth Geneva Convention." The Israeli government at the time, and every one since, ignored this consensus position. Meron is currently president of the International Criminal Tribunal for the former Yugoslavia. New evidence shows government's adviser on international law said in 1968 that demolishing terror suspects' homes violates Geneva Convention. It was March 1968. Yaakov Herzog, director-general of the Prime Minister's Office, received a memo marked "Top Secret" from the Foreign Ministry’s legal adviser, Theodor Meron. As the government's authority on international law, Meron was responding to questions put to him about the legality of demolishing the homes of terror suspects in East Jerusalem and the West Bank and of deporting residents on security grounds. His answer: Both measures violated the 1949 Fourth Geneva Convention on the protection of civilians in war. The government's justifications of the measures – that they were permitted under British emergency regulations still in force, or that the West Bank wasn't occupied territory – might have value for hasbara, public diplomacy, but were legally unconvincing. The legal adviser's stance in 1968 is important today precisely because it is unexceptional. It's the view of nearly all scholars of international law, including prominent Israeli experts. The memo shows that from the very start of the occupation, central figures in the Israeli government knew that deportations and demolitions violated Israel's international commitments, and not just in the eyes of outside critics. Yet both measures have been used ever since. If any later Israeli leaders saw Meron's opinion, they ignored it, and so misled the public and Israel's supporters abroad about the legality of their policies. If later leaders did not see the document, they nonetheless engaged in deliberate naivete, convincing themselves of the hasbara line in the face of the evidence. The memo is not the first evidence of Meron's warnings, though. In 2006, I published another of his legal opinions, which I found in the late Prime Minister Levi Eshkol's declassified office files. Written in mid-September of 1967, about three months after the Six-Day War, it responds to a query from Eshkol's bureau about the legality of establishing settlements in the West Bank and Golan Heights. He answered, "My conclusion is that civilian settlement in the administered territories contravenes explicit provisions of the Fourth Geneva Convention." Central figures in Israel’s government at the time – Eshkol, Foreign Minister Abba Eban, Defense Minister Moshe Dayan and Justice Minister Yaakov Shimshon Shapira – all received that legal advice. A week and a half later, the cabinet approved settlement in the West Bank for the first time. Ex post facto, a few scholars have manufactured the justifications for settlement that are regularly cited for hasbara purposes. But their legal gymnastics have never convinced anyone who was not trying hard to be convinced. About Theodor Meron: Born in Poland, he spent his early teens in a Nazi labor camp. After he arrived in Palestine, he made up for his lost school years, then completed a law degree at Hebrew University, a doctorate at Harvard and a fellowship at Cambridge, both in international law. Then he joined Israel's foreign service. A decade after writing the legal opinions described here, he returned to academia to teach international law at New York University. In 2001, as a U.S. citizen, he was appointed a judge on the International Criminal Tribunal for the former Yugoslavia. Today he is president of that court and one of the world's leading authorities on humanitarian law in war. After his 1967 opinion on settlement became public, he told The Independent that he "would have given the same opinion today." The reason is clear from his 1968 opinion on demolitions, in which he dismissed "narrow, literal" interpretations of the Geneva Convention. The convention, he said, "is a humanitarian convention that aims to protect the rights of a civilian population." Put differently, the convention can't be interpreted by splitting hairs and forgetting real human beings. Its point isn't to protect states. It is to protect people from a state whose army has conquered the land where they live and before whose power they are otherwise defenseless. If it is ignored, their basic rights will be trampled. The discovery of Meron's memo on demolitions and deportations is additional evidence that the regime under which the West Bank is governed began in deception and has been maintained by self-deception – by the government, by the hasbara machine and sometimes by our Supreme Court. That memo has already been submitted to Israel’s High Court of Justice by the Center for the Defence of the Individual and other human rights groups, in support of their request that an expanded panel of justices hear their challenge to the policy of demolitions. The court should accept that request, which gives it a chance to end the deception and put a stop to an unjust policy – one that should have ceased the day the memo reached the Prime Minister's Office 37 years ago. Gershom Gorenberg is the author of "The Unmaking of Israel" and "The Accidental Empire: Israel and the Birth of the Settlements, 1967-1977." Follow him on Twitter: @GershomG. New Deputy Foreign Minister Tzipi Hotovely on Thursday told ministry employees that all of the Land of Israel belongs to the Jews, and that Israel had no need to apologize for that. 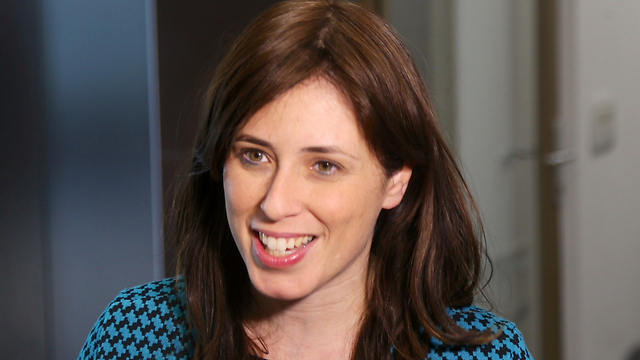 Hotovely, who days ago told Ynet that her hawkish views would not get in the way of her work as Israel's most senior diplomat, said that Israel had no need to apologize for its stance. Lieberman, who heads the right-wing Yisrael Beiteinu party, made his remarks earlier Thursday in an interview with Israel Radio. “Anyone who thinks going back to the 1967 lines will solve the conflict is autistic,” Liberman said. Jay Ruderman, the head of the Ruderman Family Foundation, had demanded that Lieberman apologize. In a statement released later Thursday, he cited Lieberman as stating, "I didn't mean in any way to offend autistic people, but wanted to illustrate the unwillingness of some people to accept certain realities about the Israeli-Palestinian conflict, and I apologize if anyone was hurt." "We hope this was a teaching moment for MK Lieberman that it is highly inappropriate to use a disability in a derogatory manner," said Ruderman, whose foundation is dedicated to strengthening the relationship between Israelis and American Jews, and to the inclusion of people with disabilities in the broader society. "We are gratified that he has publicly apologized and distanced himself from the remark." From new roads to increased work permits, the IDF is trying a new approach in an effort to preserve the delicate security situation in the West Bank. The term "apartheid" resurfaced in Israel on Wednesday as critics lashed out at a very short-lived plan to segregate Israelis and Palestinians on public transport in the West Bank. After several hours of fierce criticism from across the political spectrum, Defense Minister Moshe Ya'alon and Prime Minister Benjamin Netanyahu decided to suspend the plan. Meanwhile on the ground, efforts are being made to calm the situation. Officials in the Judea and Samaria Division and the Civil Administration are currently promoting a series of measures to ease Palestinian movement on the roads of the West Bank, as part of Central Command policy to create a gulf between terrorist organizations and the Palestinian population, and maintain the delicate security situation in the territories. The Judea and Samaria Division are working to improve access for Palestinian vehicles in a series of locations across the West Bank. For example, a new access road was recently opened for the village of Beitin, near the Beit El settlement, and, an intersection between the town of Tulkarem and the Avnei Hefetz settlement was opened to Palestinian traffic. 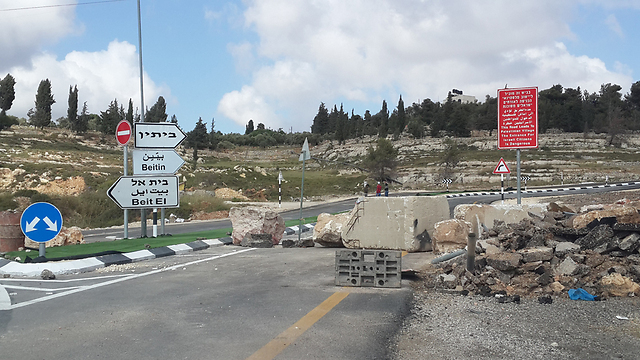 At the same time, the IDF is also working to renovate the northern entrance to the town of Bani Na'im near Hebron, which had been closed for security reasons. The army is also accelerating efforts to build a new access road to Kafr Qaddum. The road to the village was closed several years ago after it was deemed too close to the settlement of Kedumim, a move that forced the villagers to make a detour of more than a half hour's drive to get to Nablus. The closure of the road also led to violent Friday demonstrations against the security forces. "We are making this the focus and we have already been doing so five or six years," a senior officer in the Samaria region told Ynet. "The objective is to build a safe new route with illumination." Most Palestinians in the West Bank have full freedom of movement, and most checks are for Palestinians traveling from Judea - Bethlehem and Hebron – northwards via East Jerusalem to the Ramallah area, and vice versa. Palestinians are currently allowed to travel freely with their vehicles on the main roads used by Jewish travelers, such as Route 60 and Route 35. Additionally, residents of Jenin are not prevented from taking their own cars to nearby Afula if they choose to visit relatives in the town of Dahariya, north of Beersheba. Palestinian builders working for IDF These measures come in addition to a series of steps by the IDF Central Command and the Judea and Samaria Division to preserve the security situation, even at an unusual price for the IDF's West Bank bases. It is not out of the ordinary these days to see Palestinian workers from Ramallah renovating the Judea and Samaria Division headquarters. At the same time, the Judea Brigade Commander, Colonel Yariv Ben-Ezra, promotes the issue of expanding the industrial area south of Hebron to the northern part of the nearby town of Yatta. Along with these steps comes the IDF recommendation to the political echelons to stop freezing of the transfer of Palestinian tax money, a step that is causing a wages crisis in the Palestinian Authority. The recommendation was eventually accepted, along with dozens of cases of the IDF allowing Palestinian police cars to travel on the roads of the West Bank alongside Jewish vehicles. A senior officer in the Judea and Samaria Division tells Ynet that 700-800 truckloads of goods pass daily through the Tarqumia crossing, and more than 13,000 work permits and 4,000 trade permits have been granted to Hebron residents so that they can earn a living in Israel. "In a city like Hebron (the biggest Palestinian city in the West Bank – YZ), the economy is booming," says the officer. However, the officer makes it clear that Hamas is still trying to establish a cell set up and infrastructure in Judea and Samaria. "We will continuously fight terrorist activity; we will disrupt it and take all measures to prevent a conflagration. There are many measures to ease life for the Palestinians. Every commercial or construction project that you initiate, along with increasing construction in Area C, pushes the Palestinians for the better. Easing life for the Palestinian population produces peace and security in a clear way. We can see that over the years, so does reducing the age of Palestinians working in Israel without a permit, from 60 to 55." Israel announced on Wednesday that it rejects a Swiss court ruling to pay $1.1 billion to Iran over the sale and shipment of oil prior to the Iranian revolution in 1979. "Without referring to the matter at hand," said the Israeli ministry of finance, "we'll note that according to the Trading with the Enemy Act it is forbidden to transfer money to the enemy, including the Iranian national oil company." Israeli media quoted the official Iranian news agency, IRNA, which cited an "informed source" within Tehran's Presidential Centre for Legal Affairs giving details of the Swiss Federal Supreme Court ruling with regard to a "joint oil venture". Iran has been embroiled in a legal battle against Israel in courts in Switzerland and France, demanding that it should pay the debt. The argument dates back to a 1968 agreement between Israel and the Shah's government. 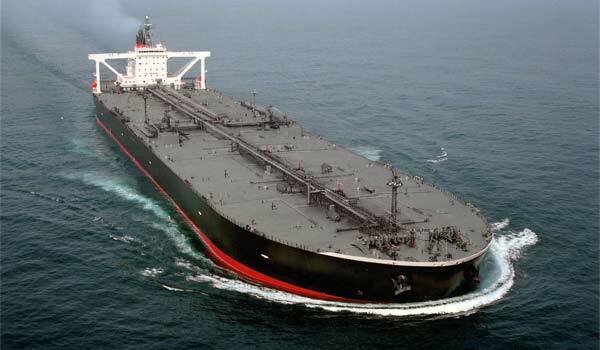 The Iranian Oil Company delivered 14.75m cubic metres of crude oil through the Eilat-Ashkelon pipeline to Israel's Trans-Asiatic Oil Company valued at $450m.